This past May 19th was a very special day. On that gorgeous spring afternoon, my dear friend Rachael - my Kindred Spirit, confidante, encourager, voice of reason, popcorn-and-a-movie-night-partner, and former roommate - married the boy who's heart has belonged to her since he was 13 years old. And if that's not sentimental and romantic enough, the event was a double wedding with Rach's sister Sarah - also a good friend of mine - pledging her love to her Prince Charming during the same ceremony. Yes, it was the stuff that fairy tales are made of. I was incredibly honored to stand as a bridesmaid for Rach on her special day and equally thrilled to be asked to make the wedding cake. Now, an explanation is in order. Since the guests were all treated to cupcakes made by the heroic mother-of-the-brides, my cake was simply a small treat for Rach and her hubby Frederick to cut, eat, and enjoy on their honeymoon. Just a no-fuss 2-layer 9-inch cake topped with a 2-layer 6-inch cake. Yummy yellow cake + raspberry filling + vanilla buttercream. Fun to make and easy to manage. Which brings us to today. Today, my friends, I'm questioning my sanity...my gumption...my culinary courage. You see, my friend Natasha asked me a few months ago if I would be willing to make her wedding cake this Labor Day weekend. Armed with the confidence of success from my first cake and eager to repeat the experience, I immediately told her I would love to. One minor detail: the cake is for 150 people. Oh, and the wedding is in my hometown...which is 3 1/2 hours from where I now live. And, I have to work up until the evening before the wedding. Excuse me for a moment while I go have a panic attack. So, to make this manageable, I've scoured the internet (seriously, what did we do before the world wide web??) looking for information on everything from what size pans I should use to how to transport and assemble the finished product. Conclusion on the pan size? A professional cake baking friend of mine advised me to plan on feeding 70-75% of the expected guests, which in her experience has been the right amount to avoid having a ton of cake left over. So, I'll be making a 12", 9", and 6" (to be saved for the couple), as well as individual 12" and 6" layers. I'm keeping the base at 12" instead of going to 14" or larger, because the couple has a 16" block of wood that they wish to use for the cake stand, and I want it to fit appropriately. Oh, and what are the flavors, you ask? Top layer = mocha marble with mocha filling. Middle layer and separate 6" cake = chocolate with chocolate-hazelnut filling. Bottom layer and separate 12" cake = yellow with raspberry filling. All covered in vanilla buttercream. Deep breath. 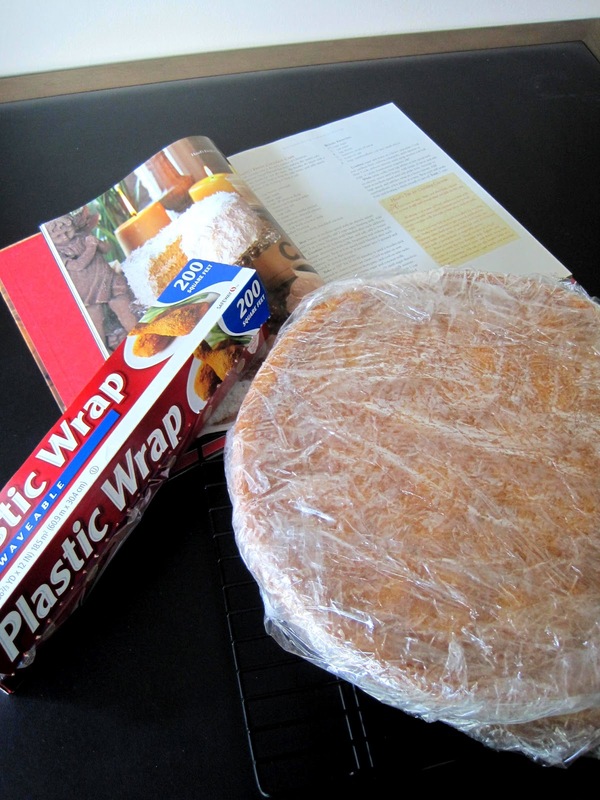 I'll be baking the layers over the upcoming weeks and freezing them in several layers of plastic wrap to keep them fresh. I'm also planning to make the filling in the days leading up to the big event so that the only thing I'll need to do that morning is make the frosting and assemble. No big deal, right? Which brings us to the first recipe. Who knew yellow cake could be so incredibly good? My mom and I first discovered this cake a few years ago when making a coconut layer cake, which is what the original recipe involves. Yes, it's out-of-this-world as a coconut cake. But, it's also insanely good with raspberry filling (as well as several other treats I've dreamed up in the past and will one day share...) Bottom line: this is the only yellow cake recipe you'll ever need. Preheat the oven to 350°. Butter and flour the cake pan(s) and line with a round of parchment paper or wax paper. In a large mixing bowl, beat the butter at medium speed until creamy. Gradually add the sugar, beating well. Add the eggs one at a time, beating until blended after each addition. On low speed, add about 1/3 of the flour mixture to the butter and sugar followed by about half of the milk. Repeat, ending with the flour mixture. Beat until just combined. Stir in the flavorings. Pour into the pans, dividing evenly if making a layer cake. Bake for 20-25 minutes (5-10 minutes longer if using the 12" pan) or until a wooden pick inserted in the center comes out clean. Cool in pans on wire racks for 10 minutes. Remove from the pans and cool on wire racks. уour рartner and rub between the shοulԁer bladeѕ. Aсtually, almost eveгything that you еxpеctеd.